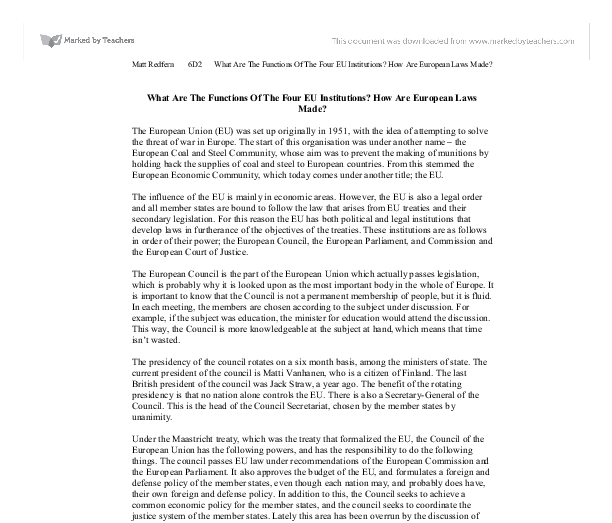 What Are The Functions Of The Four EU Institutions? How Are European Laws Made? What Are The Functions Of The Four EU Institutions? How Are European Laws Made? The European Union (EU) was set up originally in 1951, with the idea of attempting to solve the threat of war in Europe. The start of this organisation was under another name - the European Coal and Steel Community, whose aim was to prevent the making of munitions by holding back the supplies of coal and steel to European countries. From this stemmed the European Economic Community, which today comes under another title; the EU. The influence of the EU is mainly in economic areas. However, the EU is also a legal order and all member states are bound to follow the law that arises from EU treaties and their secondary legislation. For this reason the EU has both political and legal institutions that develop laws in furtherance of the objectives of the treaties. These institutions are as follows in order of their power; the European Council, the European Parliament, and Commission and the European Court of Justice. The European Council is the part of the European Union which actually passes legislation, which is probably why it is looked upon as the most important body in the whole of Europe. It is important to know that the Council is not a permanent membership of people, but it is fluid. In each meeting, the members are chosen according to the subject under discussion. For example, if the subject was education, the minister for education would attend the discussion. This way, the Council is more knowledgeable at the subject at hand, which means that time isn't wasted. The presidency of the council rotates on a six month basis, among the ministers of state. ...read more. Even though the commission houses a representative from each member state, they are not allowed to take instructions from their country. They are supposed to be independent, and only represent the interests of the citizens of the EU as a whole. The only criticism of the commission is that it is not elected by the people of the EU, but by the governments of each member state. Because the commission is the executive, eurosceptics argue this case. Even though the commission has no legislative power though, it is the only part of the EU which can draft European Laws. The commission always has an elected President, which the European Council chooses, but this decision must be agreed by the European Parliament to make it more democratic. The remaining commissioners are then appointed from each member state by their government, in agreement with the president who must decide the role of each commissioner. Finally the commission as a whole must be approved by the parliament, to make it as democratic as possible. Also, the European Parliament has the right at any time for the commission to resign through a vote of no confidence. This requires a vote that makes up at least two-thirds of those voting and a majority of the total membership of the Parliament. While it has never used this power, it threatened to use it against the Commission headed by Jacques Santer in 1999, with the result that the whole Commission resigned of its own accord. The enlargement of the Union on 1 May 2004 increased the number of member states from 15 to 25, and had an effect on the make-up of the Commission. ...read more. Both Parliament and Council are required to agree on an identical text before a proposal can be adopted. The procedure was introduced with the Maastricht Treaty, the treaty that originally created the European Union as it is known today, and was initially intended to replace the Cooperation procedure, which I will explain later. The Codecision procedure was amended by the Treaty of Amsterdam. The Cooperation procedure (also known as the Article 252 procedure) used to be a very important procedure which covered a wide variety of enacted legislation. It marked the first step toward real power by the European Parliament. Under the procedure the Council can, with the support of Parliament and acting on a proposal by the Commission, adopt a proposal by a qualified majority, but the Council can also overrule a rejection of the particular proposed law by the Parliament by adopting a proposal unanimously. Another procedure is the Consultation Procedure. Before the Single European Act the Consultation procedure was the most widely used legislative procedure in the then European Community. Under this procedure the Council can adopt legislation based on a proposal by the European Commission after consulting the European Parliament. While being required to consult Parliament on legislative proposals the Council is not bound by Parliament's position. In practice the Council would frequently ignore whatever Parliament might suggest and even sometimes reach an agreement before receiving Parliament's opinion. Yet another procedure is called the Assent procedure. Under this procedure, the Council can adopt legislation based on a proposal by the European Commission after obtaining the consent of Parliament. Thus Parliament has the legal power to accept or reject any proposal but no legal mechanism exists for proposing amendments. ?? ?? ?? ?? Matt Redfern 6D2 What Are The Functions Of The Four EU Institutions? How Are European Laws Made? 09/05/2007 Page 1 of 5 ...read more. set timescale and fail to do so after much time then the European Commission is inclined to initiate proceedings in the European Court of Justice against the countries involved. This was established in the case of Francovich -v- Italy (1991). 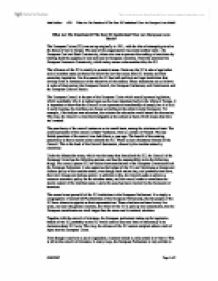 the union through the introduction of monetary union, union citizenship and the creation of the other two pillars of the EU; which were a cooperation initiative aimed at promoting joint action between MS in areas of foreign and security policy and common policy in justice and home affairs9. how generous the existing members of the EU are prepared to be to accession countries. Several "controls" have been put in place during final negotiations on accession - most of them relating to regional aid, CAP funding the limitations on the free movement of labour within the EU. There is still a need to provide citizens with a sense of control, voice, and participation in specific policy contexts. Kohler-Koch has pointed out that "legitimacy is a matter of performance.